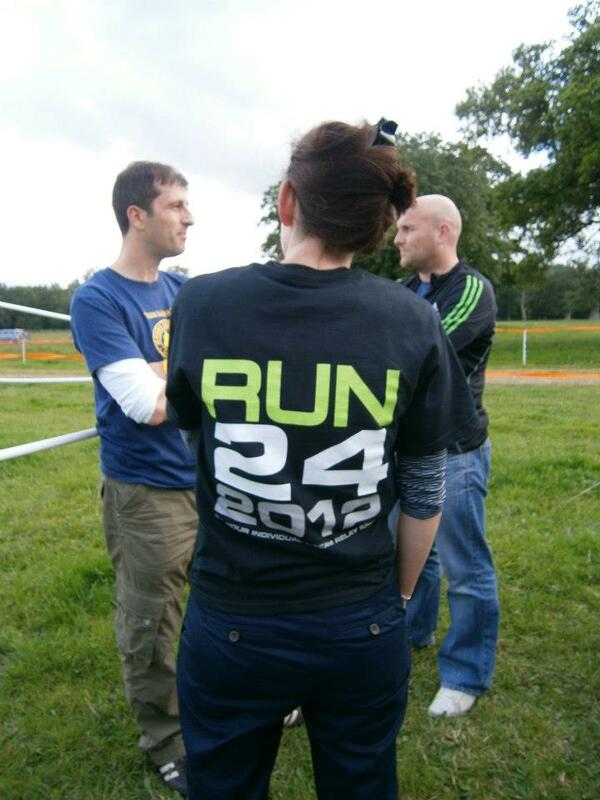 I saw the Run 24 event advertised a few months ago and entered as I fancied the challenge of a 24 hour endurance event, which was a format I hadn’t tried before. As the event took place virtually on my doorstep (I live a few miles away in Reading), I couldn’t say no and signed up as a solo runner with my regular running buddy Paul Stout. My usual weekly training consists of several short runs (4-5 miles) during the week at lunch or from work to home and back to back runs of 10 miles on Saturday and Sunday averaging around 50-60 miles per week. Generally most of these runs are at a comfortable pace. The build up to this event was not what I would have planned to be honest. Since April I have had a string of minor injuries culminating with an Achilles tendon strain during an “easy” Sunday morning run at the start of June. The three weeks before the event was spent “RICE’ing” the Achilles. I managed some “power walking” when I could but only had my first non-stop pain free run on the Thursday before the event so was a little concerned about how I would hold up for the full 24 hours. I also had a minor calf niggle (par for the course to be honest) so was exploring a few different options like calf guards and tape the week before the event. I was planning for the full 24 hours but wasn’t sure how I would hold up and decided to just give it a go and see how I went. The evening before the event, fellow Reading Jogger Matt Brown and I travelled down to help set up the campsite. 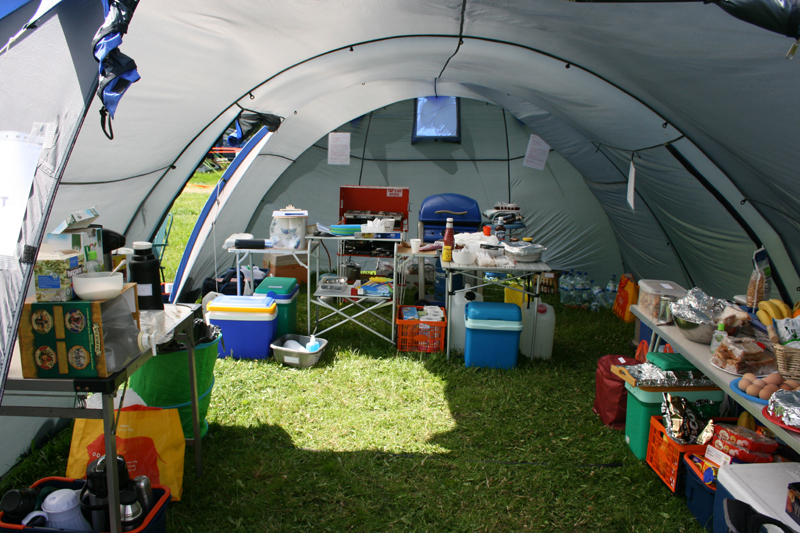 The Reading Joggers had entered a number of teams and had been planning this event for months with the idea of creating their own personal “race village” complete with cooking facilities, massage tent and sleeping quarters. The soloists were allowed to pitch their tent next to the track so Stouty and I set up his tent there, which we would share but not planning to use. Stouty kindly picked a spot next to a portal (he knows me so well). For probably the first time ever before an overnight Ultra I had the comfort of sleeping in my own bed and not having to get up early which meant I was pretty well rested. Stouty and Matt picked me up at 10am and he immediately commented on the rocktape strapping on my calves and Achilles and accused me of being a “big time Charlie”. “What happened to the days you just limped around?” he asked. We drove down to the start and arrived at about 10.30am which gave us plenty of time to organise our gear, get changed and catch up with a few new faces and other friends/teams who were also taking part. 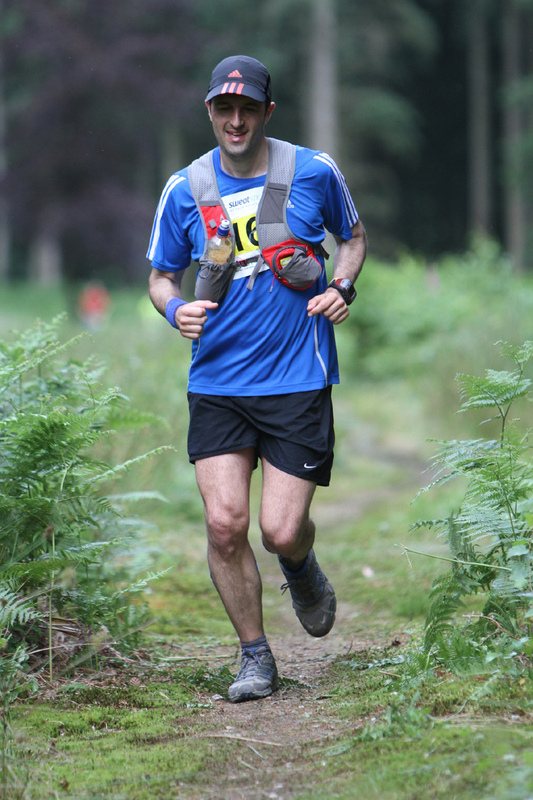 I spoke to a couple of Fetcheveryone members and also said hello to Jim Seaton who is a fellow parent at my daughters school, Jim was undertaking his first ever Ultra at this event. As a member of the Reading Joggers, I was pitching in with the food bill and brought down my allocated supplies for the team. In return, I could have access to some hot food on the go which was great. However, I had also planned my own food and drink strategy and took a plastic crate full of gels and various snacks and I also took a cooler box full of water bottles and iso-tonic drinks. As the weather was going to be warm, I iced half the bottles the night before and left the others chilled. The plan was to take the chilled bottles first and by the time I had finished those, the iced ones would have defrosted but would still be ice cold or at least chilled. I also had a race plan in mind. Having looked at the Thunder Run results the year before, the male solo winner had completed 120 miles with the rest of the top finishers completing 100 miles. My minimum target was 100 miles which I knew was achievable having completed the Thames Path 100 in March in 23.5 hours in fancy dress although my absolute stretch goal was 120 miles. This would mean 1 x 5 mile lap every hour for the full 24 hour period, easy at first but after 5, 10, 15 hours? Probably a bit more difficult then. This would mean no stopping and going through the night which is not my strongest point so I had packed electrolyte tablets/gels with caffeine stimulants and the iPod for company as I couldn’t rely on Stouty’s company as he is probably a little stronger than me over these distances and could be ahead of me by then. 31 male solo entrants started the race and I thought my minimum goal of 100 miles might get me a top 10 position and my ambitious target of 120 miles may give me a shot at a podium spot based on the Thunder Run results. However, there were lots of variables outside of my control like the level of competition as there are a lot of guys doing Ultra’s who could comfortably achieve this goal. So having no idea of the level of competition and facing some uncertainty over the ability of my Achilles to hold up to the stresses of 24 hours on my feet, I was going to stick to my own plan, see how the first few laps went and take it from there. Stouty, was teaming up with a few friends in the all female “One Direction” team who had brought down a camper van and had offered him some food facilities. As we know the girls quite well, we did have a little side bet of who could do the most miles with a Stouty and I combining a total (expectation of 2 x 100 miles each = 200) against their team total + 6 laps (my estimated total for them of 170 miles + 6 x 5 miles = 200) with the losers buying breakfast, the challenge was on! Shortly before 12 noon, we headed towards the race briefing where Chris the Race Director offered a few last minute instructions before we headed off. Stouty and I started near the back with the majority of the solo runners (who were all wearing yellow numbers) whilst those in teams bolted off at the start. The route is a nice 5 mile trail around some private grounds in Wasing Park. The start runs along a tarmac strip to a gate which leads up a small hill before a gravel path and then onto a proper trail in a wooded area. There are probably another 2 hills before the route loops back around towards the start. The 4 to 5 mile point is good as it heads downhill towards the start location and then loops around the field and back past the start/finish line. The route was marked with orange tape and then later glow sticks marking the direction and warning of any hazards along with arrows marked on the ground. I heard some comments (second hand) after the run about the undulating nature of the course, the footing and running conditions in the dark. In my opinion, these were fine and this is exactly what trail running in the dark is all about. The only minor criticism I would make is that the path could have been made a little wider for runners in a couple of areas particularly through the 0.5 to 1 mile point. However, the race did spread out quite quickly and wasn’t an issue for the steady runners like myself. 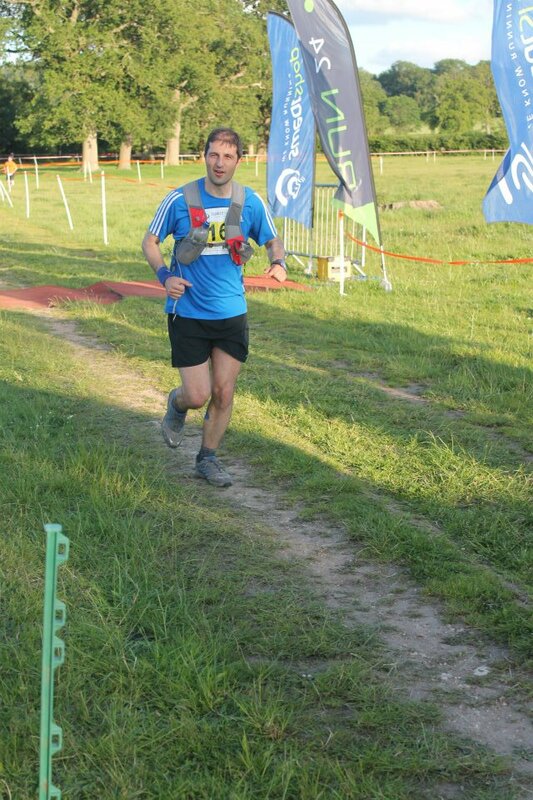 Stouty was setting a pace faster then I had planned and he ran on ahead as I settled into an easy rhythm and chatted to a few other guys around me which seemed to be a mix of both experienced and rookie runners to Ultra’s or races of this format. A short while later Stouty bounded past me! I wasn’t sure what was going on until he explained that one of the tapes had been removed/fallen and a few of them had run straight on instead of turning right resulting in an extra few hundred yards before a marshal corrected them. The issue was resolved quickly and I don’t think it occurred again. Stouty bombed ahead again as I tried to keep the pace slow without success. My first lap came in at nearly 44 mins so quicker than I wanted to run and so I made a determined effort to slow the pace over the next few laps as I wanted the run to feel easy so I could carry on running as far as I could. The next few lap splits were reported as 45 mins, 47 mins, 50 mins, 52 mins and 56 mins so I managed to achieve this by striding the uphill sections and then continuing to jog on. I chatted with a couple of other solo runners including Shaun Brady, Tony Slessor and another friendly chap whose name I didn’t get but I had recognised him from the Compton 40 having spoken to him then. At the 5 hour stage, things were going well. I had hardly stopped and had some slick pit-stops (thanks to Matt and Margaret in particular) who just handed me a bottle of drink, a gel and one or two snacks (Monster Munch crisps were probably the highlight as they were easy to consume) per lap as I trotted past which meant I hardly stopped. Obviously this wasn’t going to carry on through the night but I took advantage when I could. I was operating on the basis of consuming around 60g of carbs and 500ml of fluid per lap but wasn’t going to beat myself up if I ate or drunk a bit more or less. In addition, I carried some electrolyte tablets which were neatly stored in a small button bag on the shoulder of the UltrAspire Spry race vest (review here)I was trialling for easy access. The race vest was perfect for the run as it gave me enough space to carry my essentials (a bottle, phone, a few snacks) had a rear stash pocket for any extras (cap, jacket, head torch) I added the electrolyte tablets to my water every few laps or so. The iced drinks strategy was working well as I picked up some refreshing drinks each lap especially as the weather was becoming quite warm. My Mum & Dad also popped down and watched a couple of laps on the Saturday and the brief support was much appreciated. Especially with little or no contact with people between laps. 24 hours is a long time with no conversation. There was an electronic leader board and chip timing system in operation but this appeared to be facing the outside of the track and I didn’t really see or pay attention to where I was position wise and how the other runners were doing. As you finished each lap there was an announcer commentating on people’s progress which was where I had received confirmation about which position I was in each lap. It would have been really useful if there was a second leader board on the track for the runners to observe along with a note of each persons race number as I was fairly oblivious to who was ahead or behind and how many laps people had done. A little more transparency here may have assisted the competing soloists. However, I did get a bit of a feel for who the guys were around me and surmised that Stouty, Tony Slessor, Jonathon and perhaps two others were ahead of me but we were all pretty much on the same lap at that time. This was confirmed as I headed in after my 5th or 6th lap and was informed Stouty was 2nd place and I was placed in 5th or 6th position. I had bumped into Shaun again en-route who was wearing his name on his back. Unfortunately, the “A” had come off his running top leaving the message “Sh un” which I commented on. Amazingly, he actually managed to find the missing “A” somewhere on the route hours later! My 7th lap was a sluggish 1.04 but I had picked up a burger after lap 6 and had to walk the first mile as it took me this long to consume and digest the burger in small bite size chunks. I had my first issue on this lap when my Achilles started to pull particularly on the uphill parts. I took an ibuprofen at the time making a mental note of the time in case I needed another later and carried on but I started to feel really sleepy at about 6pm in the evening! It got so bad that I was doing the one eye open/one eye shut trick for a while before this feeling eventually cleared. I blamed the ibuprofen and thought that perhaps the drowsiness was a side effect. I did manage to catch up with Stouty at this point who was struggling a little with this hamstring which was sore. Therefore at the end of the next lap, we jogged in together and I dug out the rock tape and someone kindly strapped his leg as I headed out again. I reminded him about his earlier “big time Charlie comment” with the strapping, welcome to the club mate! My stomach felt quite full after the burger stop so I didn’t take a snack on the next lap and just grabbed another gel just in case. I had been refuelling really well and my body felt like it was at the stage where it was trying to absorb everything I had eaten and so I went with the feeling of not eating for a lap or two. I spotted the Reading Joggers coach Arthur en-route a few times who was acting as team camera man. He always seemed to catch me when I had a walk break so I probably didn’t give the impression I was trying my hardest! I was in a good rhythm now with clear running sections and a few break sections on each loop. I had only had one minor pit stop for the toilet and minimal stops for snacks/food and was pleased that I was spending the majority of the time out on the course. At around 7.30 all runners were required to take out their head torch for the night leg although it wouldn’t really get dark for another couple of hours. As this time approached I dived into the checkpoint grabbed my bag with my head torch, backup hand torch, a buff, base layer and some spare batteries and headed out. I put all of this in the stash pocket of the race vest initially until I needed to use it. Packing the essentials in a clear sandwich bag made it dead easy to see and grab what you needed and save a minute or two of faffing around. With a planned sedate pace, other teams and runners were passing me from time to time and I spoke to a few people briefly but generally most of the team runners were giving it everything and speeding past me. The all female One Direction team of 4 were going really well and both Nina and EJ belted past me on a few occasions but strangely I didn’t see Harriet or Sue at all. I spotted a number of the Reading Joggers teams thanks to the idea of the bandanas and gave the odd hello. The Reading Joggers “A” team in particular were absolutely flying round. In addition, I was really impressed with Dave Ayling from the Reading Joggers who passed me several times over the weekend and looked fresh, strong and pretty cheerful each time he ran around. I think a solo effort beckons for Dave soon as he would do really really well. As the evening progressed, the PA system was turned off to allow people to have some quiet time at night. With soloists stopping at different points for comfort breaks/a rest/food it was difficult to track who was ahead and behind but the Reading Joggers kept feeding me information from the leader board. I got a text from Stouty to say that he wasn’t feeling great and had been ill and was probably going to call it a day which wasn’t good news for me as he’s the one who keeps me awake at night although it wasn’t unexpected as I had thought we would be running our own strategies this weekend. When I say strategies, mine was the well thought out, planned and scientific approach and Stouty’s was well just “run”. I hit the 50 mile mark in under 9 hours (8hrs 47) which was an hour under my schedule but I felt ok. It started to get cooler as the sun disappeared and the night set in, I pulled out my base layer from the stash pocket of the Spry vest and put this on. I also donned my buff and head-torch (which felt more comfortable on over the buff) and plodded on. About this time I started to use the gels with caffeine and electrolyte tablets with a caffeine stimulant in them. Knowing the night time is not my strongest point, I was prepared for it early. As it got darker it had started to seem more remote on the course and I had the perception that there were less people around me. I had been going now for a few hours now by myself and without much conversation and decided to put on the iPod and work through a few issues of the Marathon Talk podcast (I’m a few months behind these but catching up). My groin was starting to feel a little uncomfortable and sore particularly on the downhill parts but I refrained from taking another ibuprofen as I was still blaming that for making me drowsy earlier and I couldn’t afford to drop off now. As I completed another couple of laps, I benefited from the Reading Joggers race village as I would trot into the team area, ask if there were any cups of tea on the go (which there always was) drink up, grab a snack and trot off. The cups of sugary tea helped keep my body warm as the temperature cooled particularly as the pace was starting to slow with the groin. The good news was that I had worked myself into the lead during the night so the sure and steady pace was working well for me. I don’t recall overtaking any solo runners during this period so assumed a few of them had stopped at night for a short while. I passed the 65 mile at around mid-night and was still an hour ahead of my 1 hour per lap schedule. I was now into the real night time phase and tiredness had started to affect me. It was a real challenge to try and stay awake and I tried to employ all the usual tricks to keep myself alert. I switched the iPod playlist to some comedy podcasts to try and engage my interest a bit further but this just washed over me. I do enjoy the sensation of being out running (plodding) in the dark when I’m alert. The trail was easy to follow with glow sticks which had been put out in the evening now marking the direction of the trail. Still after 14 or 15 laps by now, I should be able to get round in my sleep which was pretty much what I was doing! It was around this time that I felt my groin giving me a bit more trouble and running was too uncomfortable and I decided to switch to the Cliff Young shuffle (http://en.wikipedia.org/wiki/Cliff_Young_(athlete) – please read it’s a great story) and shuffled as far and as fast as I could. I was trying to keep a balance between making reasonable progress without feeling too uncomfortable and was aiming to keep a 4 mph pace. I didn’t feel too concerned at the time about not running much (in some respects it’s a bit of a relief), I was simply switching to Plan B and was going to push on as far as I could at the pace I could and see where it got me, taking inspiration from the aforementioned Cliff Young (minus the gum-boots). The pace naturally slowed and the hour or so I had made up on the plan was slowly being whittled away. I passed to 80 mile mark at 4am to the deathly silence of the camp and entered our tent to put my Garmin on charge as it was low on battery power for the second time. Stouty was asleep here and he awoke briefly and asked how I was doing as I exited. I then plodded over to the Reading Joggers area to grab a cup of tea, strap my groin and change my socks. This was my only real “stop” and took about 15 minutes but I did welcome the sitting down and getting off my feet which were feeling pretty sore by now. I was also feeling colder as the lack of running had resulted in my core temperature dropping and I was starting to feel the cold so I grabbed a light pair of gloves and a my mid-layer from the kit and then headed out for another lap. You could start to see traces of light in the sky and it gradually got lighter although I was still feeling sleepy. I think it was around here that Tony Slessor caught up with me and we had a brief conversation, I think he was just overtaking me at that point but I couldn’t confirm my mileage as the Garmin was charging (and was now a lap or maybe two out as it had been charging up as I had been continuing the laps). He seemed to have a bit of strength in him and moved on ahead of me. The interaction between all the competitors was pretty good, I guess there was a level of respect between everyone who put themselves on the start line. I finished the next lap and grabbed a bowl of porridge, gulped down a cup of tea and removed my mid-layer and gloves, buff and torches and put my cap back on and headed out. I had now completed about 90 miles and it was 7am in the morning, the night leg was finally over. The depressing thought was that there was another at least another 5 hours to go. I plodded around another lap to make it to 95 miles and then set out again to on my 20th lap. At this point I was reported as being in 3rd place. I think Tony was one of the people ahead of me but didn’t know who the other guy was. Matt sent me a text when I was a mile into this lap to say 4th and 5th were on the same lap and about 5 and 10 minutes behind me but were still running to some degree and were going to overtake me this lap. I thought to myself, well I’ve given it a good effort and when I finish this lap I will have achieved my minimum goal of 100 miles despite walking for about 40 of them. When 4th and 5th overtake me, I wasn’t in a position to respond by upping the pace or running and there didn’t seem any point in walking another lap or two so I made a decision to stop at the next lap and I started to relax a bit on this “last” lap. My wife Sal called me to ask how I was getting on and I probably grumbled a bit at her as I was at my mental low point now. 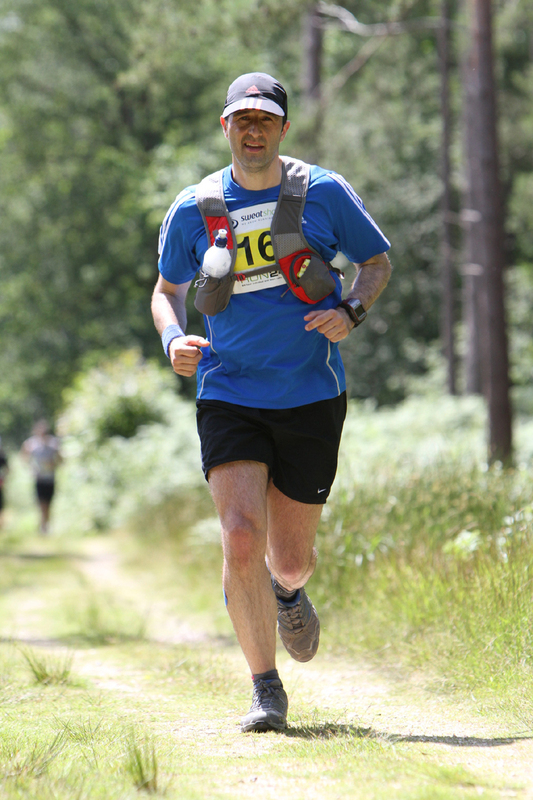 A few minutes later the fourth placed runner Guy came past me and stopped briefly for a chat. He was still running pretty well and looked fairly strong as I was hobbling along and I told him that he was now in 3rd position. However, he then said that his target was 100 miles and he was going to stop. I was pretty up front and said to him if he carried on he could get a podium spot as I was only walking and I tried to persuade him to jog on as he ran on ahead. With about a mile left of this lap John who I thought was 5th caught up with me. 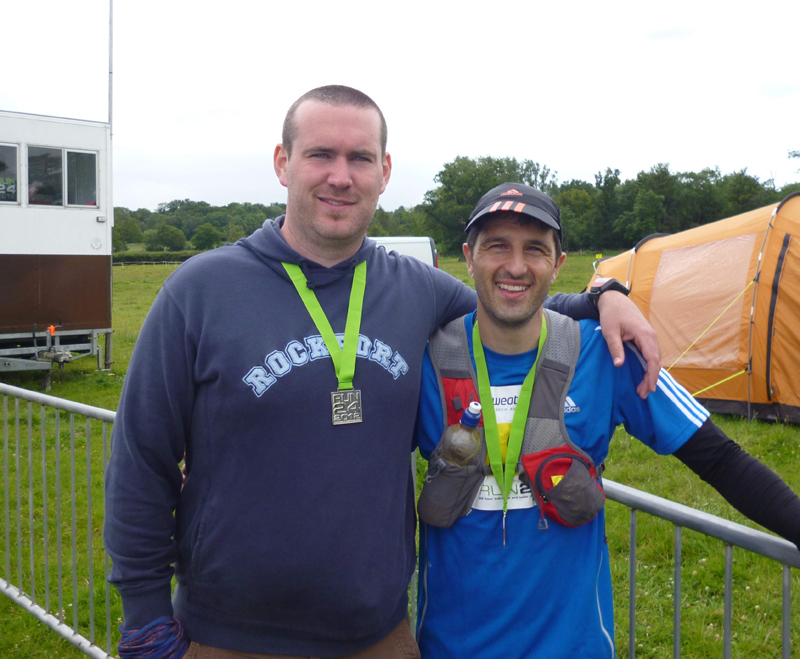 I had met John very briefly at the Kent Roadrunner marathon a month before and we had a brief chat where he told me that he had stopped for a 3 hour kip at night. He was still running and I told him that I Guy was maybe 10 minutes ahead and he had a chance of 3rd if he carried on and I was probably going to stop at the 100 mile point. However, John said he was probably going to stop at 100 miles. Looking at the results after the race I may have been mistaken about Jonathon’s position as he may have been a lap behind me. Again, I wasn’t 100% sure on this. I got a couple of follow up texts from Sal employing a bit of reverse psychology to try and give me a push. Even since I mentioned I hadn’t DNF’d a race, she can now play the “why are you quitting?” line. Well I still thought that was it then as I ambled into the start finish area glancing at the clock to see I had covered 100 miles in under 22 hours distance even when I had walked the last 8 hours. As I walked past the start area I saw Stouty standing next to Tony Slessor. I asked Tony why he wasn’t still out there as he had been ahead of me. Tony said he’d met his target and stopped but if I carried on another lap then I would get ahead of him. Again, I really wasn’t clear on who was where and how many laps they had done but Tony had been 2nd I think and doing another lap would move me back up to 4th and what if Guy did stop? Between a brief half conversation with Stouty and Tony and a text with Matt, they made it pretty simple for me, “Can you manage another lap?”, “Physically yes”, “Then go do it” and in the space of a minute or two I hobbled out again to start lap 21. It was now about 10am and I had 2 hours to complete a lap which was easily achievable even at my reduced pace. If I finished this lap before 12 noon I would be allowed to start another lap meaning 110 miles (22 laps) could be accomplished. As I left to start my 21st lap I heard the PA announcer confirm that the race leader had just completed his 21st lap and was nearly a lap ahead. Fair play mate I thought, all he has to do is walk another lap or two and that’s the win. The weather got a little cooler and it started to rain and so I put my base layer back on at this point. I carried on with the lap under the impression that I may be 4th or possibly 3rd but I wasn’t clear who was left on the field. The first placed person was still ahead. I couldn’t really believe people were now stopping especially when they were moving quicker than me and had a good chance of a podium finish. Then unbelievably, I received the news that the leader had actually stopped at lap 21 and hadn’t headed out again. I was due to complete the next lap by about 11.30am and still had enough time to start another and if I set out for 1 more lap I would be in first place! I couldn’t believe it to be honest. Surely one of the other guys would check the leader board, get wind of the fact that I was still plodding around and do another lap. I can only assume when someone said they were retiring, that was it and they wouldn’t be allowed back on the course. I set out for the next lap and texted Matt en-route to ask if he was really sure of the positions as I still couldn’t believe I was being almost gifted the win. I plodded around now enjoying the last lap and eventually headed towards the start/finish area. Stouty met me ahead of the finish and gave me the big thumbs up and congratulations. As I entered the finishing turn I decided to run the last couple of hundred yards in an attempt to look like I was a runner, although I was in a bit of discomfort and felt that the victory was perhaps a little undeserved. There was a small crowd of people gathered at the finish and I then realised it was the Reading Joggers who were aware I was in 1st and had organised a human archway for me to run through in celebratory fashion. Those last few moments of the run as I ran through the human archway to the cheers of the crowd with the PA system announcing me as the winner were amazing. I’ll probably not experience that again, so I enjoyed those few moments as Matt, Stouty and the Reading Joggers came up and congratulated me as I received my finishers medal. I think all I could manage to do for a while was lean on the railings, my energy levels felt ok and the tiredness had disappeared with the buzz of the finish but various parts of my body were sore (especially the feet). The rocktape on the calves and Achilles did the job pretty well as I didn’t have any further issues there during the run so I will definitely be looking to tape up on the next long distance ultra. Matt kindly funded me a couple of quid for a cup of tea and a kit kat as I sat down in the refreshment tent as the last teams and runners came in to the finish and Matt and Stouty kindly packed all my kit away. 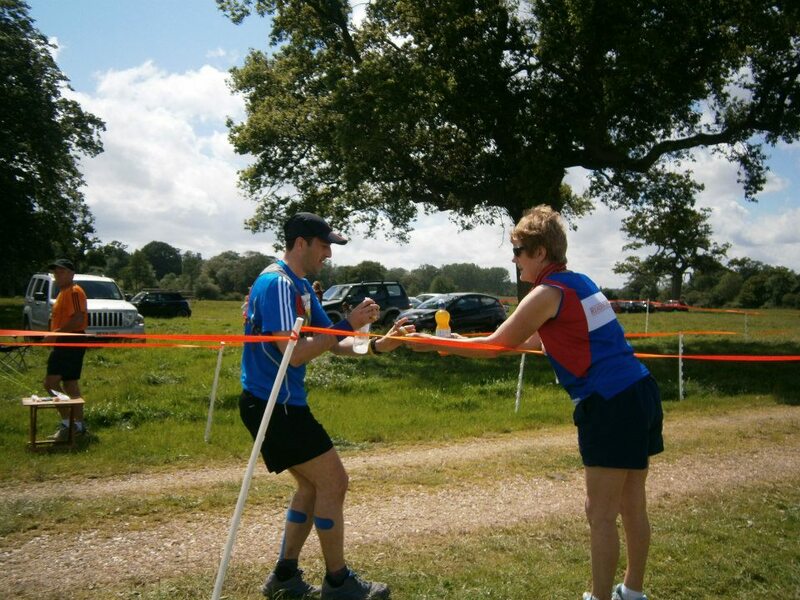 I had a quick chat with Teri Griffiths a Serpentine runner who had completed her first Ultra and did 50 miles solo which was a great effort and spoke to Nick Dodds a work colleague who was competing in a team. Sal then arrived to collect me and after the final runners had finished and had to help me up towards the presentation area as I was stiffening up and starting to feel the cold as I had stopped exercising. I also spoke to Shaun Brady again who had completed 19 laps and was probably out the course the longest finishing his last lap in 24hrs 59mins. 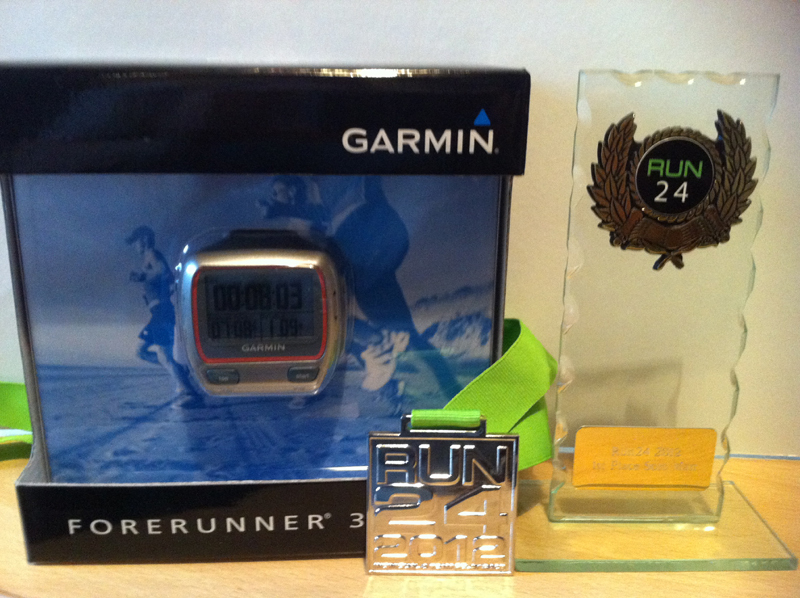 It was a pleasure to receive a trophy for 1st place and also a Garmin 310 XT as a prize, fantastic and totally unexpected! I hadn’t even thought there would be a prize. The reported 20 hour battery life will be put to good use with a couple of planned long distance runs later this year. There was some other good news aswell with the Reading Joggers “A” team taking the 8 man team win. Great achievement guys as they won by 2 clear laps aswell. However I should mention my two “heroes” of the weekend who were Nicky and Dave Sayer. Nicky and Dave were competing as a two person team to celebrate their 65th Birthdays this year, Despite, Nicky not having trained as well as she would have liked due to injury she still put herself out there over the weekend and between them they completed 20 laps (100 miles) in 24 hours. That was a truly inspirational performance guys, I’m really proud of what you managed to achieve. 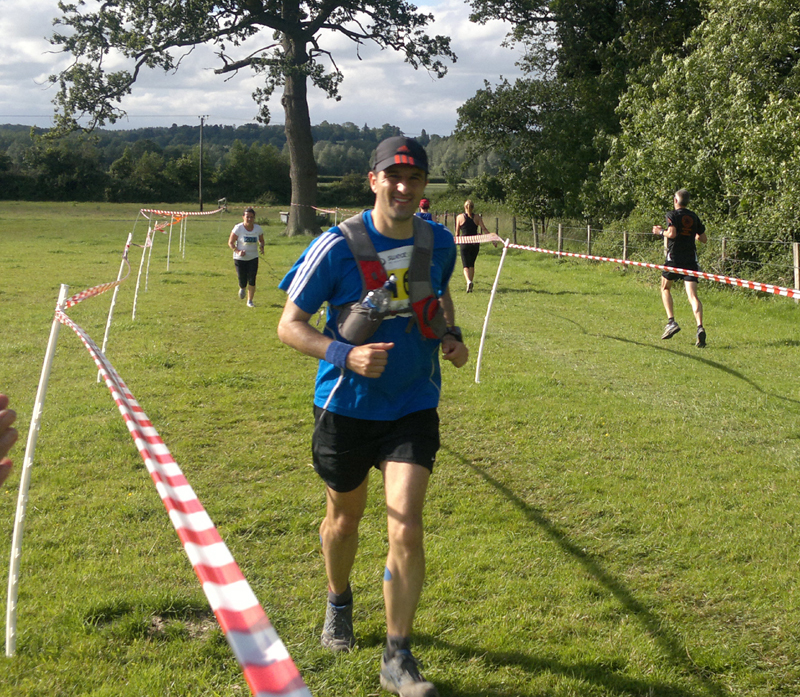 A quick well done to Jim Seaton aswell who did 100 miles in his first Ultra, damn good effort mate. Funnily enough, in my daughters small school of 50-60 kids, there are 3 ultra running Dads now. The Fathers race at Sports day is going to be hell from now on! The event was superbly organised by Chris and the team and it would be great if they could get greater numbers for next year and create an even bigger festival of running. The course was well marked and can be described as a typical trail route with sufficient variation to make it interesting although there were a couple of points where I would recommend they try and widen. The event infrastructure was good, the event was held on private grounds and they had a food and supplies store (none of which I really had a chance to try out) on site. The whole atmosphere on the weekend was great especially on the Saturday when the weather was better. I will definitely do this event again but may try a team entry so I can enjoy the social experience. The only constructive criticism I would make is (unless I was missing something really obvious here) that a second electronic leader board facing towards the runners en-route would help those soloists better understand how they were faring against their competitors. 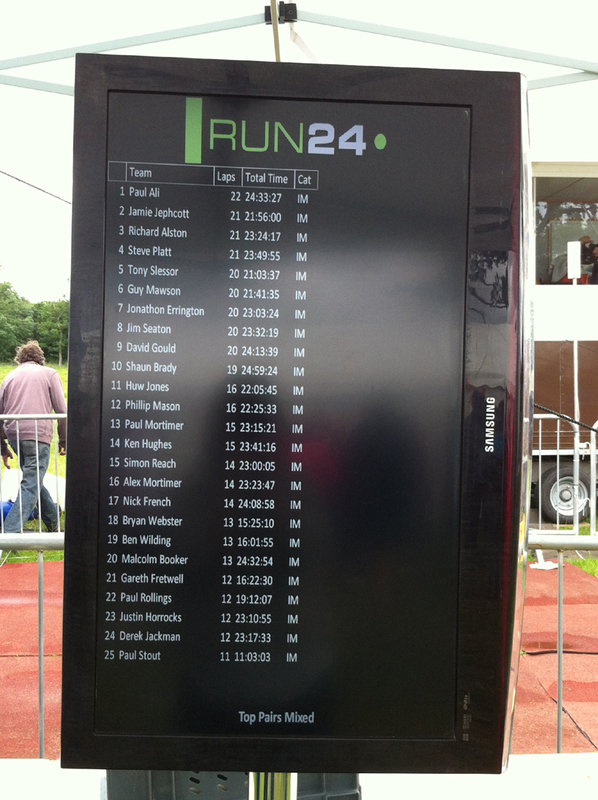 In addition, the leader board should also display each runners race numbers so those at the sharp end of the race can easily identify who is who just so everything is transparent. I was pretty reliant on Matt and a few other people feeding me information towards the end of the race as I only had half a picture of who was where. So how do I feel? Well, I will be the first to admit that the win was slightly fortuitous! I don’t know all the other runners but exchanged messages with Tony and Guy who in my opinion were capable of carrying on but they were satisfied with their own personal targets and were pretty gracious about me sneaking ahead in the end. 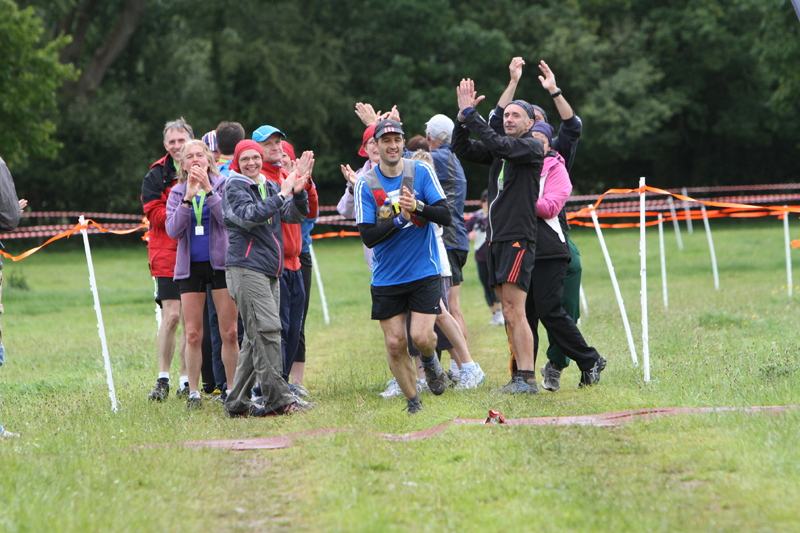 Obviously, I’m delighted to win the inaugural Run 24 race which is something I hadn’t quite expected at the start and perhaps that was some reward for enduring the whole 24 hour+ time period where I spent 97-98% of my time on the course with no rest or sleep breaks and little human interaction for 20+ hours. So points for perseverance perhaps? It pays to be prepared and a several things worked well for me over the weekend, including a pretty accurate and achievable race plan, a good food and hydration strategy with foods I was comfortable with (i.e. “powered by Monster Munch”). The chilled drinks were a dream when it was warm on the Saturday. I coped with the night leg a little better than previous night runs and suffered minimal blistering and managed to gut out the whole race period despite a little wobble with a couple hours to go where I appreciated the prodding from various people to march on. I did suffer a slight groin injury during the night (although I may have miss-diagnosed this as this feels fine a day or so later but my ankles are really swollen) and being forced to march was a little downer but it wasn’t realistic to expect to run every step of the way and I made reasonable progress with Plan B which was a fast paced hike. I didn’t quite hit the stretch goal of 120 miles but there’s always something to aim for next year? Thanks to my close buddies Matt Brown and Paul Stout and all the Reading Joggers club members for all their support on the weekend. You all made it a very enjoyable weekend for me. Oh and the breakfast challenge? Well the girls did an amazing 32 laps + 6 head start = 38 in total. Unfortunately with Stouty retiring early it meant the boys fell short and so breakfast is on us ladies, well done! Great report Paul. You fully deserved the win for staying out on course throughout. Well done. See you at Caesar's Camp! Brilliant blog, brilliant result, very well done!! Fantastic report and really well done on your win! We did this event as a team of 6-8 and the atmosphere was fab! 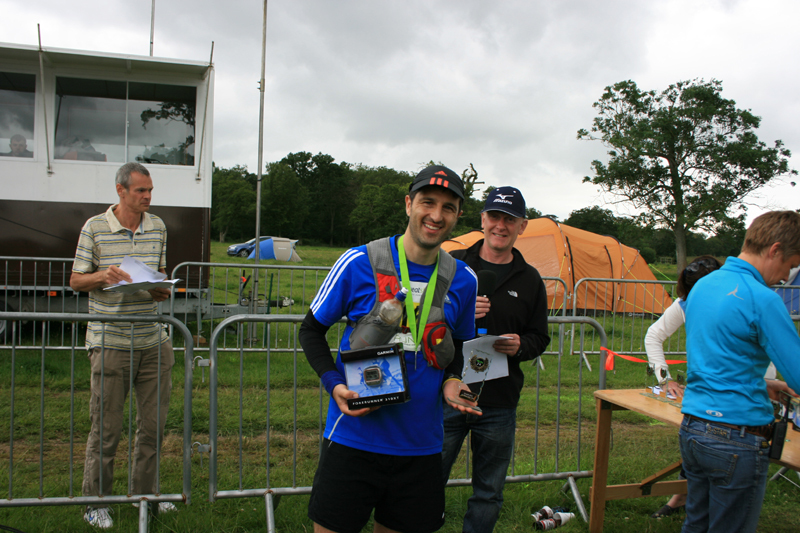 Great report Paul and great result… I was the Official Photographer at the event for Marathon Photos. Thanks for the smiles throughout the weekend, glad you like the pics..